Steadman, M (2014) Küsse [artistic director]. 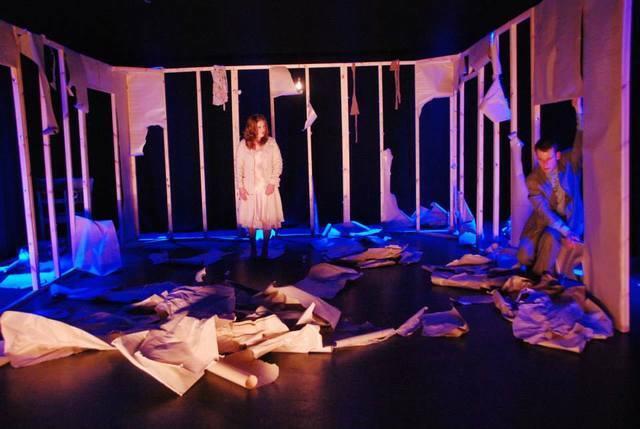 In: Küsse, Exeter Phoenix Theatre, Exeter, UK, 2 -3 June 2014. Küsse was practice-based research project thatset out to explore how performance a space and the performers’ bodies as a site where intimacy is constructed and deconstructed. Visual and spatial metaphors were articulated through the interrelationship of the performers’ bodies within a paper room set design. Bachelard suggests: ‘the house image would appear to have become the topography of the intimate being’. The room structure connotes a blank canvas filled with potential that evokes and provokes action. Throughout the performance the enactment of fantasies and desires, meetings and partings, the performers’ bodies transform and are transformed by the space. This gradually becomes un-homely or ‘unheimlich (Freud). Thus, a reversal of the metaphor of the ‘home’ as an intimate space to one of incessant physical and psychological eviction. Questions: How can the spatial design provoke imagery and shape the performance making? How can Bachelard’s notion of the ‘poetic imagination’ inform performance making? How can Release Technique be utilised as a method for generating performance material thorough ia process of embodied imagery?